The community of a backwoods Southern town grapples with the murder of a Black man who is found hanging in a tree. As events unfold, the hanging mystifies the people of the community, forcing them to confront their complicity in this man’s horrific demise. 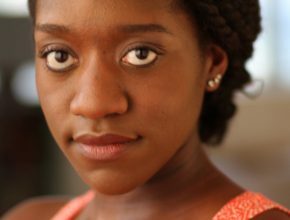 Stacy Osei-Kuffour, born and raised in Chicago, Illinois, is a BFA graduate from NYU (major: Drama) and an MFA graduate from Hunter College (major: Playwriting). 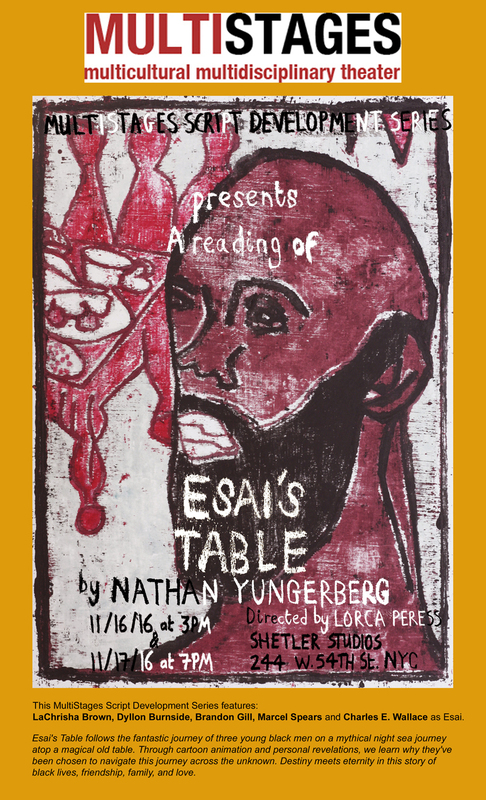 Previous plays include: The Painter, *Samuel French Festival finalist. Breathless, workshop productions at the Dream Up Festival & Downtown Urban Theater Festival (both at Theater for the New City). Dirty Blood, reading at Rattlestick Theater. Animals, *Irv Zarkower Award winner through Hunter College, readings: Lark Development Center, NYTW, Blank Theatre, and IAMA Theatre. The Pearl and The Black Sea, *Honorable Mention in The Kilroy’s 2015 The List. 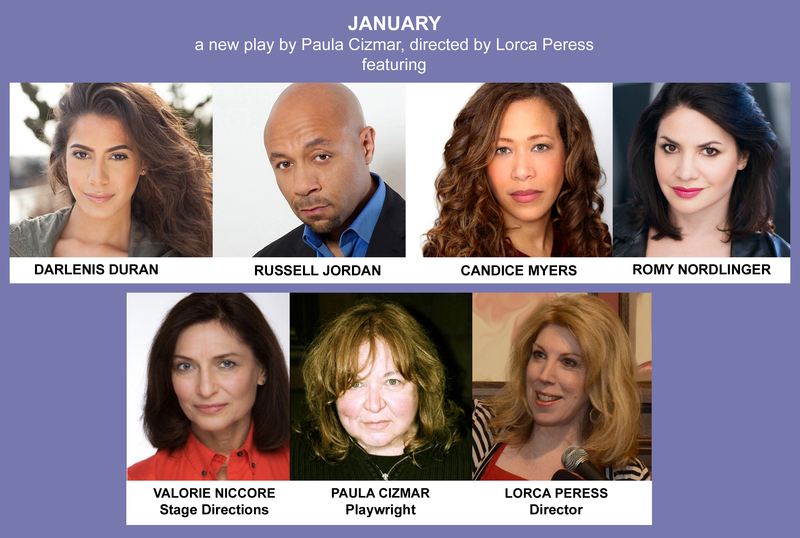 Hang Man, Bay Area Playwrights Festival finalist, Boston Court New Play finalist, MultiStages New Works Contest finalist, and The Kilroy’s 2017 The List. This past year, Stacy was accepted into EST in LA, Youngblood, MacDowell Colony Fellowship, New Georges the Jam, Nashville Repertory Theatre’s Ingram Play Lab alongside Christopher Durang, Humantias PLAY LA Workshop, and MADLAB. In addition, Stacy became a two-time Van Lier finalist at the Lark Development Center. Stacy is also a TV writer. Just last year she wrote for the TV show Happy! which airs every Wednesday night on the SYFY network. Currently, Stacy is writing for the HBO TV show WATCHMEN based on the acclaimed comic book by Alan Moore. Stacy’s goal as an artist is to bring untold stories to the stage and screen, stories that challenge our political, societal, and stereotypical views of the Black experience. Atalanta is a fearsome amateur boxer, hungry for a professional career. Abandoned at birth, Atalanta trusts no one save her faithful trainer, Samir. But when she goes head-to-head with “The Boar of Bushwick” in a highly publicized fight, Atalanta attracts the attention of her long-absent father who will stop at nothing to get her back. Inspired by an ancient Greek myth, Atalanta K.O. is the story of one woman’s struggle to be the heroine she was destined to be. D.L. 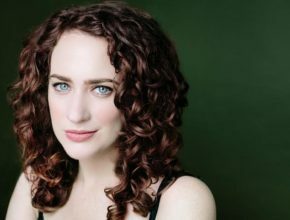 Siegel received her BA in English and Theater from Princeton University and her MFA in Playwriting from The New School for Drama. She was a member of The Amoralists’ inaugural playwriting residency, ‘Wright Club, from 2015-2016. Plays include: Members Only, Untouched, Atalanta K.O., Like the Last, Chosen, and I Know What I Saw. D.L. also served as dramaturg and co-adaptor for Jeremy Duncan Pape’s Woyzeck, F.J.F., most recently mounted at The New Ohio Theatre by No-Win Productions. She is currently workshopping ‘Untouched’ for its New York premiere in summer 2018. A born and raised New Yorker, D.L. resides in Brooklyn with her playwright husband and their beloved corgi, Sancho Panza. Visit www.dlsiegel.com for more. Awards, Grants, Honorariums: 2016 Excellence in Playwriting Award & Audience Favorite Award, Silver Spring Stage (‘Like the Last’), 2014 Finalist for Wordsmyth Theater Company’s reading series (‘Untouched’), 2014 Finalist for Heartland Theatre’s 10-minute play competition (‘…but where would they live?’), 2014 Finalist for 10 by 10 in the Triangle’s National 10-minute play competition (‘I Know What I Saw’), 2012 Georgia College & State University Arts & Letters Prize in Drama, 2nd place (‘haiku for an earthquake’). As Yolanda and Marisela embark in an epic, endless journey to find their missing daughters, the rabbit hole of violence, impunity and crime is far more insidious than they ever imagined. Pulled from real testimonies, La Ruta is a visceral unearthing of secrets left buried in the desert sand and the Mexican women who live resiliently in their wake. 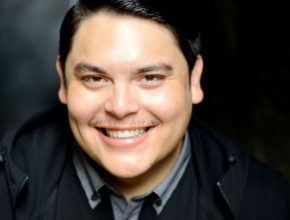 Isaac Gomez is a Chicago-based playwright originally from El Paso, Texas/Ciudad Juárez, Mexico. His plays include La Ruta (developed at Primary Stages, Steppenwolf Theater Company, Oregon Shakespeare Festival, Goodman Theatre, and Pivot Arts); Wally World (Sideshow Theater Company Commission); PerKup Elkhorn (developed at Northlight Theatre and Chicago Dramatists); The Way She Spoke: A docu-mythologia (Greenhouse Theater Center, 2016; The VORTEX, 2018); The Displaced (Haven Theatre, 2018); Throwaway Kids (Cunningham Commission for Youth Theatre — The Theatre School at DePaul University); The Soul of the World (Actors Theatre of Louisville Acting Apprentice New Play Commission). Other companies he’s worked with include Victory Gardens Theater, American Theater Company, Teatro Vista, Definition Theater Company, Jackalope Theatre, Broken Nose Theater, Stage Left, and Something Marvelous. He is the recipient of the 2017 Jeffry Melnick New Playwright Award at Primary Stages, an inaugural 3Arts “Make A Wave” grantee, an Elizabeth George Commissioned Playwright at South Coast Repertory, a member of the 2017-18 Goodman Theatre’s Playwrights Unit, Co-Creative Director at the Alliance of Latinx Theatre, a Resident Playwright at Chicago Dramatists, an Artistic Associate with Victory Gardens Theater, Ensemble Member with Teatro Vista, Artistic Associate with Pivot Arts, Artistic Curator for Theater on the Lake 2017/2018, a steering committee member of the Latinx Theatre Commons (LTC) and an artistic community member at The Hypocrites in Chicago. 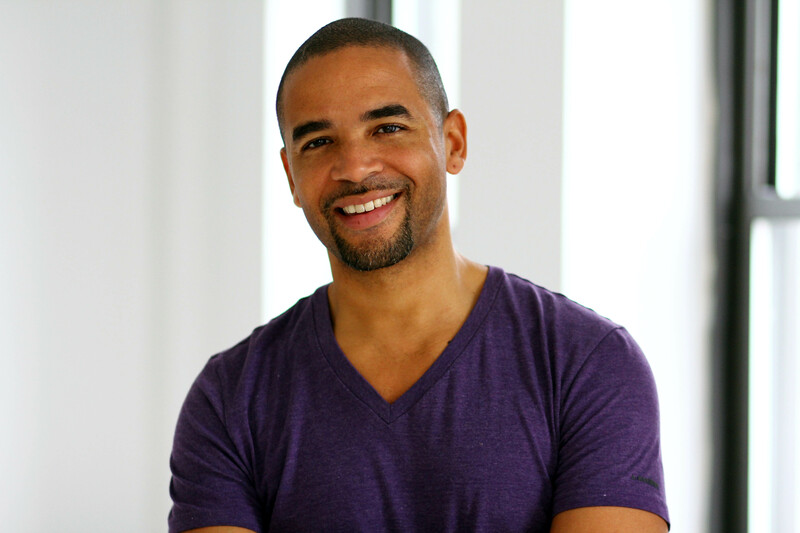 He is a Professional Lecturer at The Theatre School at DePaul University, and is represented by The Gersh Agency and Circle of Confusion. its amazing inhabitants, and our future. MultiStages Festival consists of short plays from around the world: Brazil, Uganda, Canada, Colombia, India, and the United States. Reception donated by Rums of Puerto Rico. Ticket proceeds will support the Hispanic Federation to benefit the people of Puerto Rico who survived Hurricane Maria. Actors appearing through AEA Theatre Authority. MultiStages is partnering once again with #ClimateChangeTheatreAction. 225 events are scheduled in 40 countries between October 1 and November 20, 2017. Climate Change Theatre Action is a worldwide series of readings and performances of short climate change plays to coincide with the United Nations COP23 meeting in Bonn, Germany. We are excited to produce this important event and join this world-wide theatre movement. MultiStages is joining the movement with our own multicultural and multidisciplinary “The Future is Female” Festival of Women Playwrights, Dancers, Composers, Musicians, Poets, and Artists. The Future is Female Festivals are being presented across the country in March 2017 in honor of Women’s History Month. Let’s come together in solidarity to protect women’s rights and our future. CAP21, 18 W. 18th St., 6th Fl. “The Future is Female” Festival was created by writer Mya Kagin. Instead of merely honoring women’s history in March, the festival will celebrate women’s futures. Following the election, Mya was struck by the phrase, “The Future Is Female,” which recently emerged and has taken on great significance during and after the election with many women re-contextualizing the phrase into their own modern interpretation. By participating in this joint venture, our voices are magnified and we can create a larger impact across the country. Strength in numbers — Stronger Together. 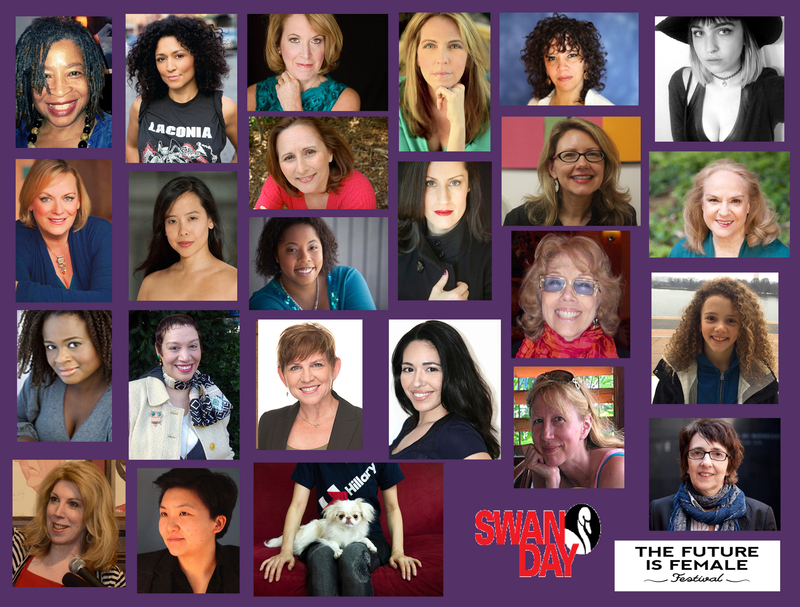 MultiStages “TFIF” Festival is a Swan Day Event! CANDICE MYERS* (Lauren) Selected theater credits include MultiStages Knowing Bliss by Arden Kass, Yeah Girl Whatever with The Dramatic Question Theater, and Third’s World written by Arthur W. French III and directed by Broadway veteran Arthur French. She has appeared in television commercials for Comcast and The Maryland Lottery. Recent appearances in the web series projects Friends or Just Roomies? (which she co-wrote and co-produced) and Q’s One Night Stands” (which has been accepted to several film festivals), and the TV show I Love You…But I Lied. www.candice-myers.com. VALORIE NICCORE* (Stage Directions) is a MultiStages Board Member, and has had the good fortune to work in engaging productions throughout the US. Regional California: Queen Ninetta in Carlo Gozzi’s, The Green Bird, Nastya The Whore, in Gorky’s, The Lower Depths; The Wife in Enrico Buenaventura’s The Autopsy from Documents From Hell; Picasso’s Desire Caught by the Tail, Countess Geschwitz in Wedekind’s, Lulu, directed by Martin Magner. Off Off Broadway: Lady Marlborough in Oscar Wilde’s The Picture of Dorian Gray (Oddysey Co.), Blanche in Dostoevsky’s The Gambler, and featured in MultiStages’ The Palace of Loneliness. TV: Fox’s America’s Most Wanted, All My Children, Another Worldand Loving. Web Series: Russian refugee in Medical Assistance. CHRISTOPHER MARSTON (Video Design Consultant) is a filmmaker based in New York City. He collaborated with Lorca Peress on MultiStages’ 2015 production of Comida de Puta (F%&king Lousy Food) by Desi Moreno-Penson, and designed video for Dacyl Acevedo’s one-woman show Will Work For in 2013. Mr. Marston has extensive professional experience as a video editor (current clients include NBC Universal and Univision). Also an accomplished cinematographer, previous work includes the entire eight-episode Webby Award winning series Gemini Rising (2010) and pilot for the new series The Weirdness (2015). LORCA PERESS (Director, MultiStages Artistic Director) Recent MultiStages Directing Credits: Desi Moreno-Penson’s Comida de Puta (F%&king Lousy Food) (HOLA Award); Temple Of The Souls musical by Anita Velez-Mitchell, music Dean Landon/Anika Paris; book A. Velez-Mitchell, A. Paris, Lorca Peress (6 Innovative Theatre Nominations, 4 HOLA Awards). Other Credits: Bernstein’s MASS (Queens College, National Opera Assoc. 3rd Prize); Nichole Thompson Adams’ Black Girl You’ve Been Gentrified (Public Theatre). Faculty: NYU Tisch Strasberg Studio, Strasberg Theatre and Film Institute. Memberships: SDC, AEA, League of Professional Theatre Women (Co-President 2011-14), Creative Network for Federal Affairs Administration Office of the Governor of Puerto Rico. Bennington College and NTI graduate.